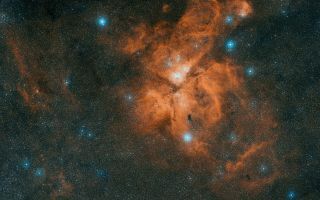 This image is a colour composite made from exposures from the Digitized Sky Survey 2 (DSS2). The field of view is approximately 4.7 x 4.9 degrees.Image released Nov. 16, 2011. This space wallpaper is a colour composite made from exposures from the Digitized Sky Survey 2 (DSS2). The field of view is approximately 4.7 x 4.9 degrees. Image released Nov. 16, 2011.